Haar-like feature descriptors were successfully used to implement the first real-time face detector . Inspired by this application, we propose an example illustrating the extraction, selection, and classification of Haar-like features to detect faces vs. non-faces. 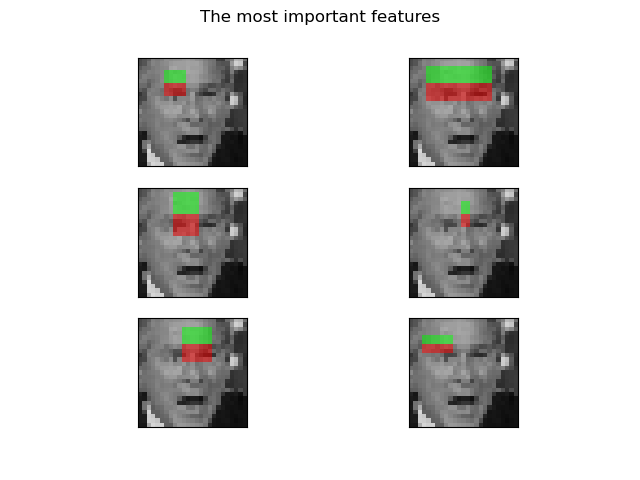 This example relies on scikit-learn to select and classify features. The procedure to extract the Haar-like feature for an image is quite easy: a region of interest (ROI) is defined for which all possible feature will be extracted. The integral image of this ROI will be computed and all possible features will be computed. """Extract the haar feature for the current image"""
We will use a subset of the CBCL which is composed of 100 face images and 100 non-face images. Each image has been resized to a ROI of 19 by 19 pixels. We will keep 75 images from each group to train a classifier and check which extracted features are the most salient, and use the remaining 25 from each class to check the performance of the classifier. # Extract all possible features to be able to select the most salient. A random forest classifier can be trained in order to select the most salient features, specifically for face classification. The idea is to check which features are the most often used by the ensemble of trees. By using only the most salient features in subsequent steps, we can dramatically speed up computation, while retaining accuracy. We can select the most important features by checking the cumulative sum of the feature importance index; below, we keep features representing 70% of the cumulative value which represent only 3% of the total number of features. # and `feature_type` to recompute a subset of desired features. # and this is where most of the time is spent, so multiprocessing is faster. # we avoid the overhead of launching a new process. 724 features, or 0.7%, account for 70% of branch points in the random forest. Once the features are extracted, we can train and test the a new classifier. Computing the full feature set took 18.910s, plus 1.197s training, for an AUC of 1.00. Computing the restricted feature set took 0.182s, plus 0.983s training, for an AUC of 1.00.